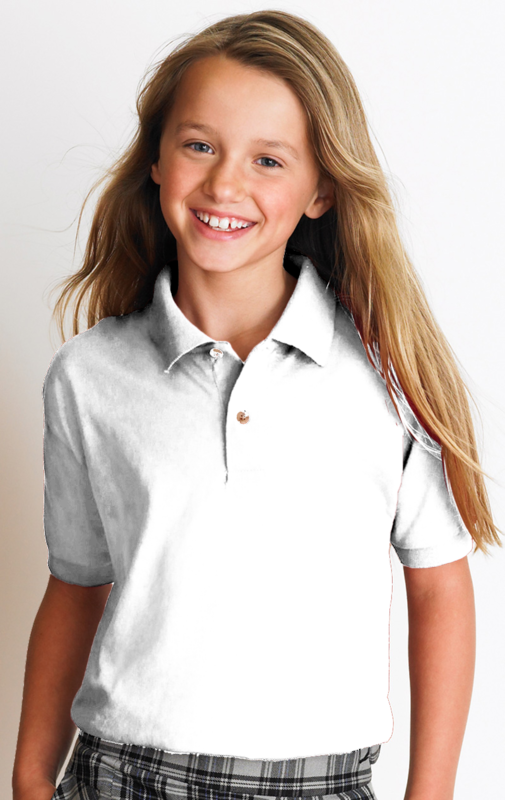 - Gildan DryBlend® Youth 6.0 Ounce Jersey Sport Shirt. - 6.0 ounce, 50/50 cotton/poly sport shirt with the same moisture wicking properties as the adult shirt. - Clean finished placket with two woodtone buttons. - Contoured welt collar and cuffs, and double stitched bottom hem. Gildan DryBlend® Youth 6.0 Ounce Jersey Sport Shirt. 6.0 ounce, 50/50 cotton/poly sport shirt with the same moisture wicking properties as the adult shirt. Clean finished placket with two woodtone buttons. Contoured welt collar and cuffs, and double stitched bottom hem. Pad printed neck label and double satin shoulder label. CPSIA Tracking Label Compliant. Transitioning to tear away label. Sizes: S-XL. Neutral: White. Heather: Ash Grey. Colors: Black, Forest Green, Dark Heather, Gold, Irish Green, Kelly Green, Light Blue, Light Pink, Maroon, Navy, Purple, Red, Royal, Sapphire, Sport Grey.